If you have been following me this year, you know that 1) my husband and I lived through a lengthy home remodel, which made it difficult to blog, live, eat, and definitely sleep! and 2) I designed a quilt using three shapes (diamond, triangle & hexagon) and have been teaching it as a mystery block of the month class locally. Please allow me to introduce you to Arabella. The picture above is the culmination of the last nine months of classes, and on Saturday, I unveiled her all sewn together with her layout and passed out October's pattern. It was a wonderful class as nearly every student was able to attend. If any non-quilters would have been walking outside our building, I'm sure they would have been wondering what in the world was going on in there as the volume of our voices got louder and louder as we got caught up, had show n-tell and then worked on blocks and talked about how each person was planning on finishing. English paper piecing (EPP) may seem intimidating especially when some quilts are completely put together with it and may be 7 to 10,000 pieces or more. My goal was to design a quilt that was doable for anyone, enjoyable even for the most of advanced students, and just challenging enough to keep interest but not so much to have a student give up. I feel like I met my goal. The triangle was the most difficult shape in this quilt because of its small size, but the quilt top would not be nearly as beautiful as it is without that shape. There is one more row to be added to the bottom (October, November, and December) and then the last borders will be added. It's been a fantastic ride for me, and I cannot wait to offer the pattern to everyone in 2016. There will be videos available to help you as well as many up-close pictures of me progressing through the blocks. 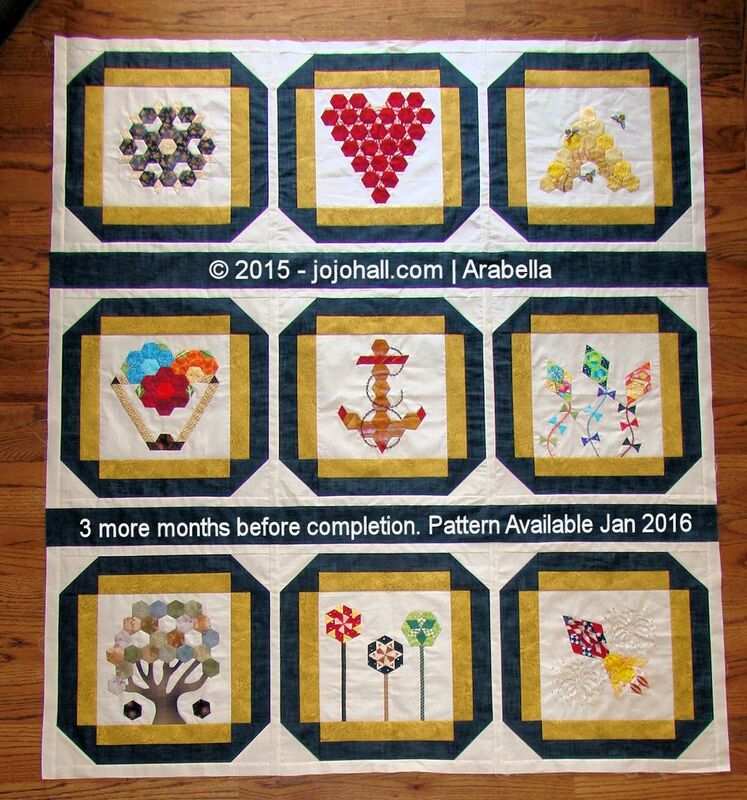 Don't let not having done paper piecing stop you from having your own version of Arabella. 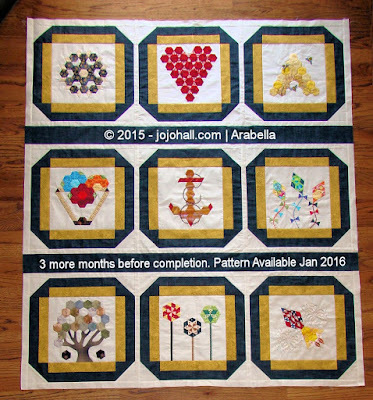 I hope you will consider adding Arabella to your must have patterns for 2016. What do you think? Are you ready for an 2016 adventure in paper piecing? This project really is a fun and addicting way to get started with EPP without committing to a project that takes thousands of shapes and years to finish.